Dave’s Away! The Market will operate as usual this Saturday except for the absence of Market Director David Hodges, who is vacationing in Ireland. 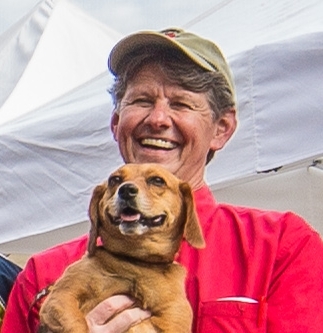 Joe Williams (who many of you will know as “Joe with the Dog Leashes”) will be on site with keys to Perkins and his usual helpfulness. If you have a true emergency you think I can help with from Europe, text me at my usual number. I’ll see what I can do. Make time for our bloggers if you can, and consider offering them samples of products they can use in their recipes. They’ll always tell readers where they got their ingredients. If you need help moving a particular product, solicit an article/recipe that features it. 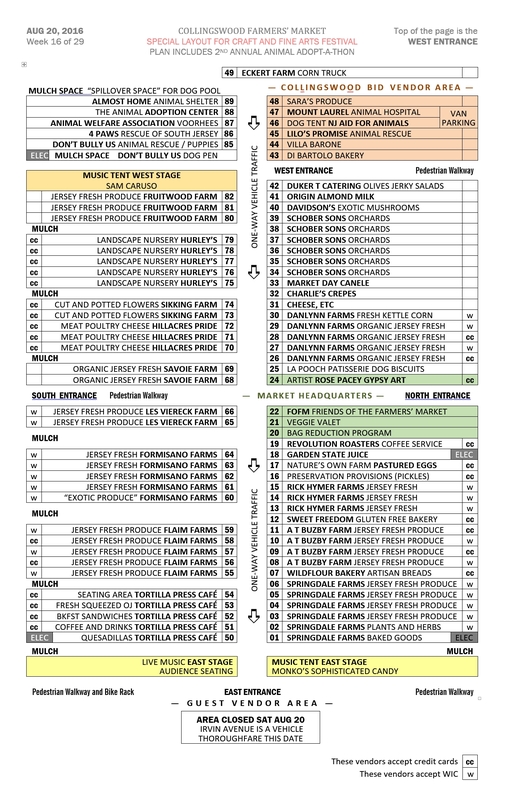 Our mission at the Market is to promote Jersey Fresh agriculture in whatever form it takes. 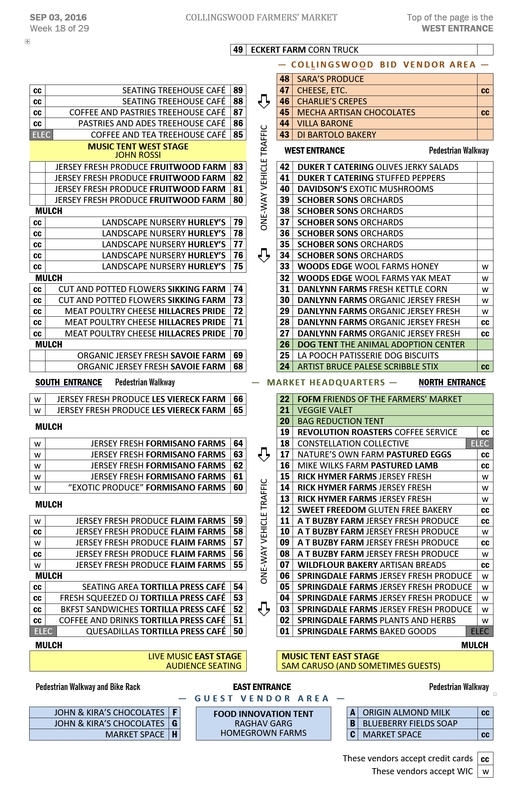 For example, CSAs, once novel, have become more common as a way to support farms with cash paid to farmers at the beginning of the season for a “share” of what the farm produces. This week, we’re making room in the Innovation Tent (Guest Vendor area) for Homegrown Farm, a unique “landless farm” housed in a container car on the parking lot of a liquor store in Pennsauken. Lots of flourescent lights running 24 hours a day provide the “sun” for this indoor hydroponic farm growing herbs and small greens. EAST STAGE MUSIC TENT. Sam Caruso (and guests if he chooses to include them in his act) will entertain as only he (and his guests) can. WEST STAGE BELOW PATCO. 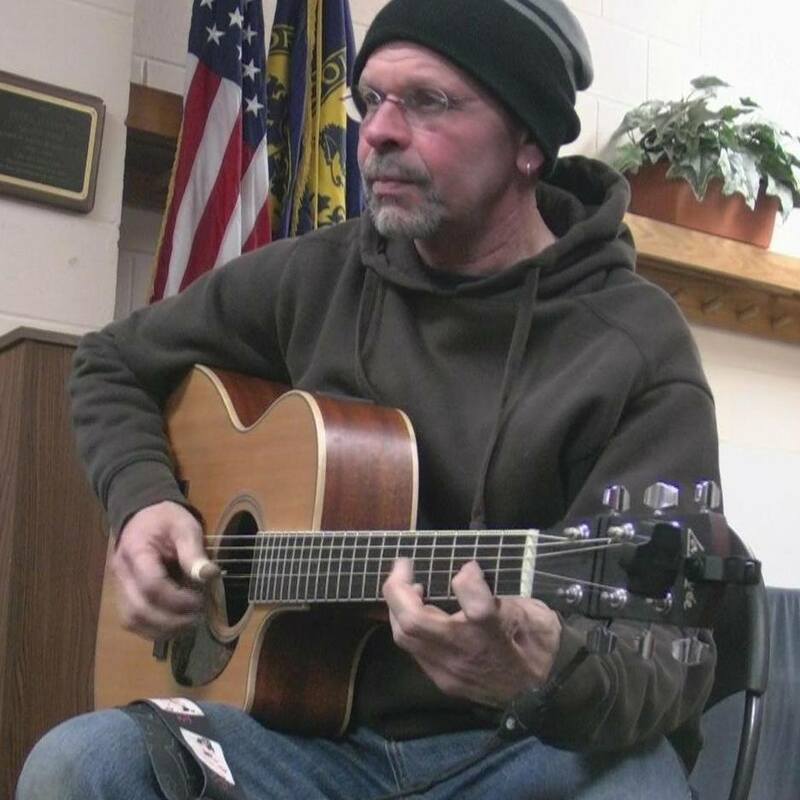 John Rossi plays his new Martin guitar and sings. Already this season, we have noticed a significant decline in the number of disposable, single-use plastic bags at the Market. We’re taking a variety of steps to help shoppers eliminate them where possible. This week, Pastor Brent and the wonderful volunteers from the First Baptist Church of Collingswood will be staffing the Bag Tent. Come by to meet them, make a bag of your own, turn your t-shirt into reusable wonderfulness, or buy one of the ready-mades. to BORROW a reusable bag from the FOFM Loaner Bag program. Perennial favorites DiBartolo Bakery, Villa Barone, Cheese Etc., and Sara’s Produce will be selling food. 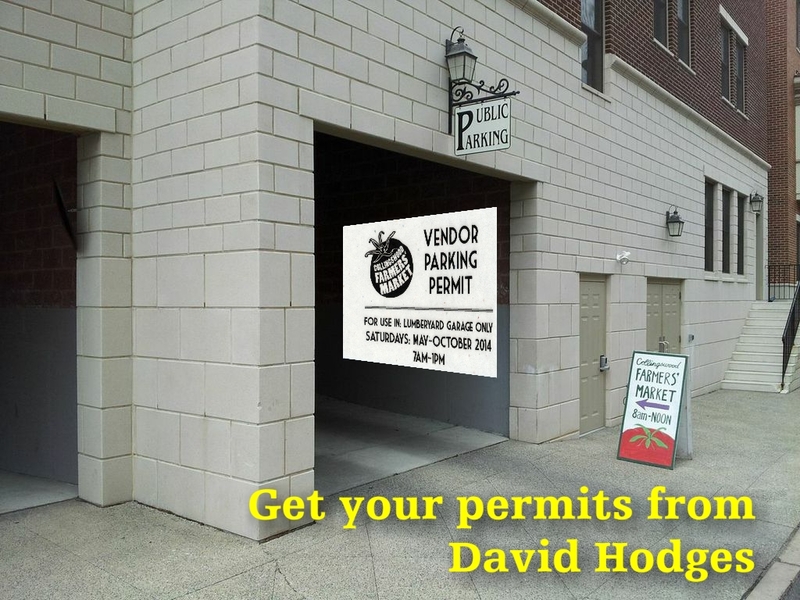 Starting this season, David Hodges is your primary contact for all BID area questions, reservations, and requests. At the usual numbers and email addresses. See below. There will be no small bills this one week, SAT SEP 03. For guest vendors who might not be aware, Joe Williams will be available with keys to Perkins Art Center, a Market sponsor, the primary benefit of which, for our vendors is INDOOR PLUMBING! Summer Beauty! If you liked last Saturday’s Market weather, you’ll be happy with this week too. In fact, the humidity is considerably lower this week, so the “feels like” conditions are more comfortable. From cowbell to cowbell we’ll have comfortable weather, light breezes, and no rain. Ideal summer Market weather. Leanne Entwistle (The Creped Crusader). Leanne, who played guitar and sang for us in the Music Tent a few weeks ago, is our newest Official Market Blogger. 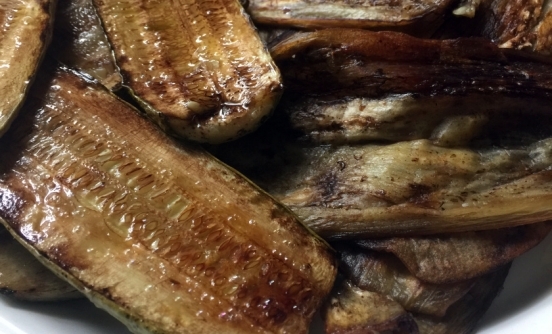 In her debut post, she shares her special treatment for zucchini she selected from Flaim Farms. LINK HERE. Susan Mauer Lynch (Yellow Room Upstairs). This week, Susan takes us on a guided tour of the treasures she found last at last week’s Market, including stops at Springdale, Buzby, Viereck, Schober, Formisano, Flaim, and Hillacres Pride for tomatoes, green grapes, pickles, cranberry beans, and cheesy crackers. LINK HERE. Beginning SAT AUG 27. Our mission at the Market is to promote Jersey Fresh agriculture in whatever form it takes. For example, CSAs, once novel, have become more common as a way to support farms with cash paid to farmers at the beginning of the season for a “share” of what the farm produces. This week, we’re making room in the Food Innovation Tent (Guest Vendor area) for Julie Pierre of Our Yards Farms. Julie’s innovation is to contract with suburban homeowners to farm “extra” land in their yards. Land lenders get a share of the production from all Julie’s farms, not just what grows on their own property. HOME DÉCOR. Virginia “Ginny” Bernier (Le Vin et La Mare) creates wine cork and sea shell creations—cork wreaths, bulletin boards, initials/letters and critters, shell wreaths, angels, mirrors, frames, and trees. EAST STAGE MUSIC TENT. The incomparable Dave Kelly never stops experimenting. If it has strings, he makes it sing. WEST STAGE BELOW PATCO. Marc Sengin looks and sounds the part of a troubador playing and singing classic pop and folk tunes of the 60s and 70s. 10 Degrees of Relief! Both our opening temperature of 72 and our closing temperature of 85 are 10 degrees cooler than Market conditions last Saturday. From cowbell to cowbell we’ll be more comfortable this week, with falling humidity throughout the day, very light breezes, and very little chance of rain. Ideal summer Market weather. You say tomato, I say eggplant. 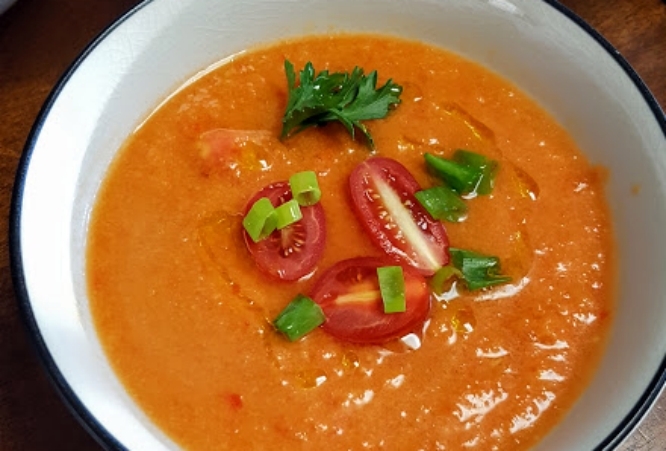 Our Market bloggers have been busy squeezing and teasing the recent bounty of succulent Jersey tomatoes into kitchen-friendly hot weather recipes (Think cooling gazpacho. 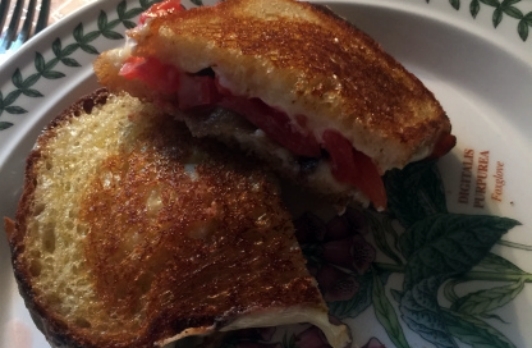 Think “no oven” grilled sandwiches.). But they haven’t neglected the bumper crop of eggplant either. Read on! Then buy and try. Christine Clarke (The Coveted Kitchen). Christine has discovered what all good Market shoppers know: in August, the vendors practically beg us to take home a case of tomatoes! Combine them with other Market goodies (cucumber, onion, sweet bell peppers) and don’t turn on a burner! LINK HERE. Susan Mauer Lynch (Yellow Room Upstairs). Susan astutely observes that this month the eggplant is EVERYWHERE: Springdale, Flaim, Buzby, DanLynn, Viereck, Formisano, Savoie, Fruitwood. When you’ve come home with eight different types, try her no-fail preparation: peel, slice, salt, brush with oil, bake. Questions? Read on. LINK HERE. Susan Mauer Lynch (Yellow Room Upstairs). Among her many charming characteristics, Susan gives everybody equal time. She wants us to choose our tomatoes from among those at: Springdale, Buzby, Hymer, DanLynn, Fruitwood, Viereck, Formisano, and Flaim. For dessert, cold melon from: Buzby, Hymer, Viereck, Fruitwood. But for no-nitrate bacon, she has just one recommendation: Hillacres Pride. As for the sourdough bread: Wild Flour Bakery. Got your list? Let’s grill. LINK HERE. GYPSY ART. 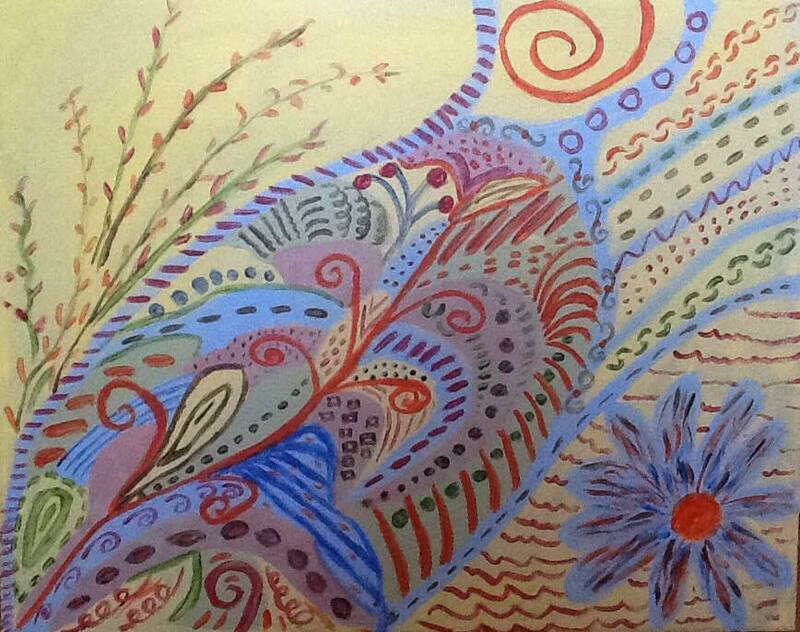 Rose Pacey creates mixed media art, beaded items, and wind chimes. AVOID THE MARKET SAT AUG 20 if you’re susceptible to adorable animal cuteness. 8 shelters, rescues, and animal adoption agencies including an animal hospital will participate in the 2nd Annual Adoptathon at the west end of the Market (in the “Treehouse Café spaces”). Dog wading pool! Puppy playpen! Dog kissing booth! You’ve been warned. 8am-noon. EAST STAGE MUSIC TENT. MONKO! Kevin Monko and anyone he chooses to bring along will produce tainted candy sounds. WEST STAGE BELOW PATCO. 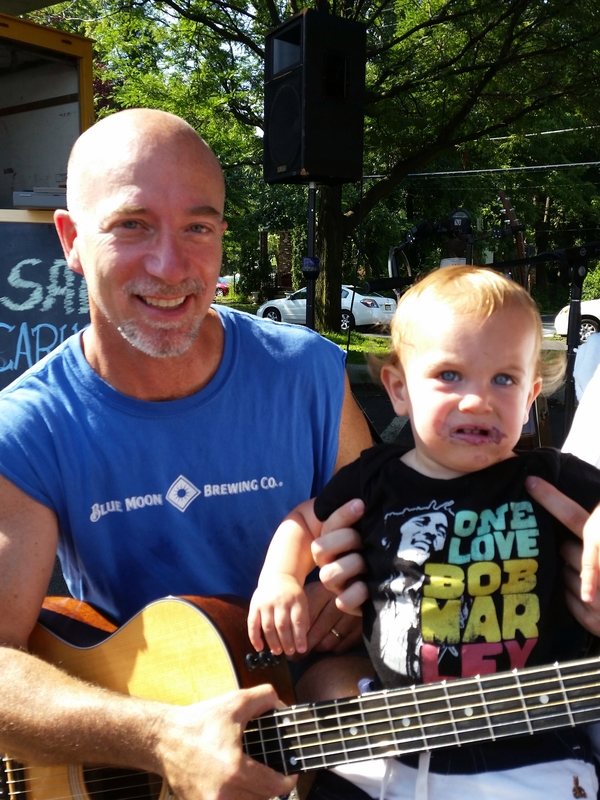 Sam Caruso and his sometime duet partner and reggae enthusiast will command your attention at the west end of the Market, near the Adopt-a-Thon. Do we really have to tell you? Anyone feeling nostalgic for “That 70s Show” will have to wait until fall. For now, it’s nothing but 80s and 90s. At the opening cowbell, the temperature will already be in the 80s, humidity around 80%, temps climbing into the 90s. But dry. No rain in the forecast. This week we’re very grateful to Patricia DiJulio for her recipe making use of fresh Market vegetables and a poached chicken breast, and to Denine Gorniak for her detailed and thrilling account of last week’s Peach Pie Baking Contest. Thank you, Bloggers! Patricia DiJulio (South Jersey Girls Grub). Patricia combines an armload of vegetables she bought at the Market with a poached chicken breast (and quinoa) to reproduce a family favorite recipe, sort of. Tell me you don’t want this! LINK HERE. Denine Gorniak (The Bicycle-Chef). Nobody does a better job than Denine of chronicling and illustrating our food contests. As she did with our Salsa contest, Denine tells the story of the contest, identifies all the winners, and shares her fantastic slideshow of the pies and their makers. But you’ll have to go to her blog to see it all. LINK HERE. Lourdes Wellness. Our Market sponsor, Lourdes Wellness, has been partnering with the Oaklyn Food Pantry to collect food at our Market once a month. Owing to your generosity in July at their monthly Market drive, the groups have collected and shared more than 3000 POUNDS of Jersey Fresh since the “Buy 2, Give 1” campaign began. Please look for them in the middle of the Market and be generous, as you have always been, you wonderful people. CREATIVELY OBSESSED. Selena Braunstein makes unique handcrafted one-of-a-kind jewelry from antique, vintage, and modern books and buttons. EAST STAGE MUSIC TENT. Leanne Entwistle brings her guitar and her lovely voice to the Market just twice this season. Life is uncertain. Come to her first gig. WEST STAGE BELOW PATCO. 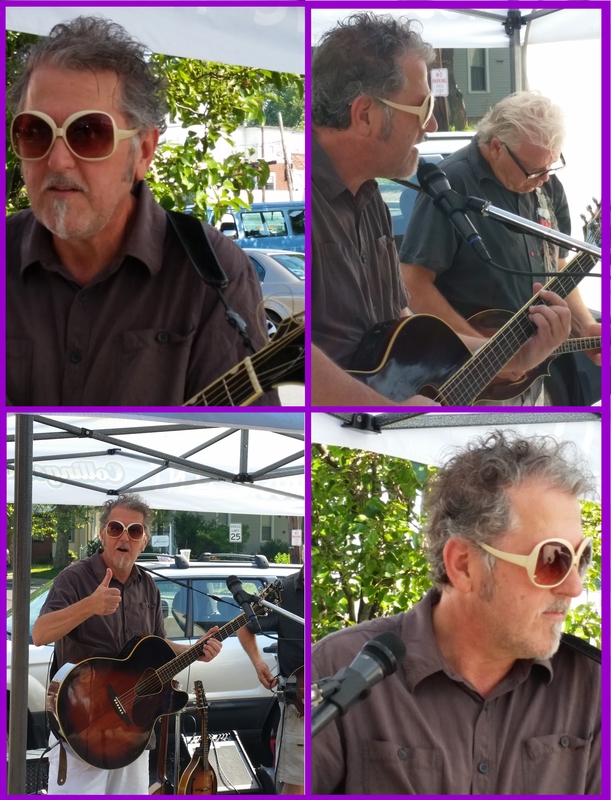 The Incomparable Dave Kelly brought out lap steel guitars at his last appearance. He’s also been known to feature the mandolin. If it has strings, he’ll make it sing. Not this week. SAT AUG 20. NEXT WEEK. Avoid the Market on SAT AUG 20 if you’re a sucker for adorable animal cuteness. 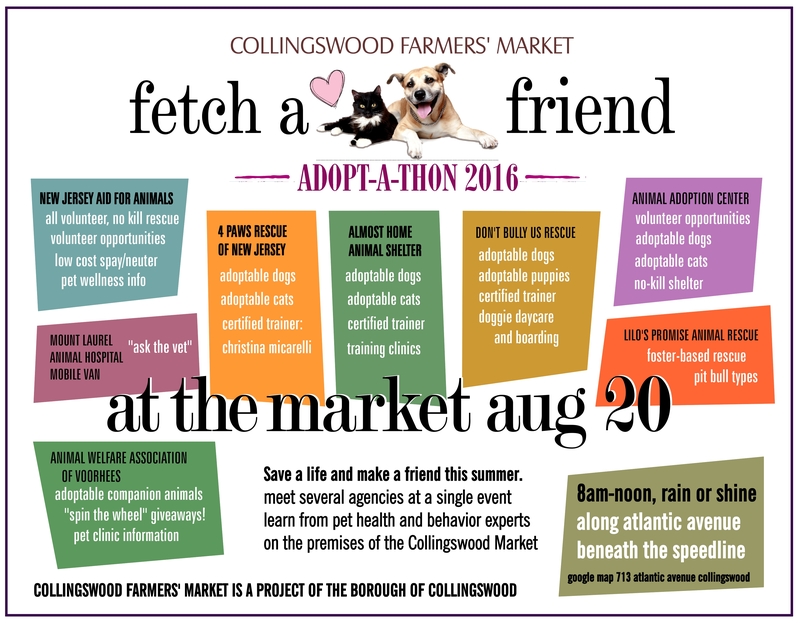 The west end of the Market will be the site of our 2nd annual Multi-Agency Animal Adopt-a-thon, featuring half a dozen adopting agencies, kissable bulldogs, services from the Mount Laurel Animal Hospital, a dog wading pool, and many opportunities to start the process of taking home a new friend. This week, Lilo’s Promise Animal Rescue will staff the Dog Tent and administer the Official Market Leash program. Guest “Baggers” have been helping out the past two weeks. This Saturday, Lindsey Thivierge is back in charge. We’ve seen this before. Sunny and mid-70s at the opening cowbell. 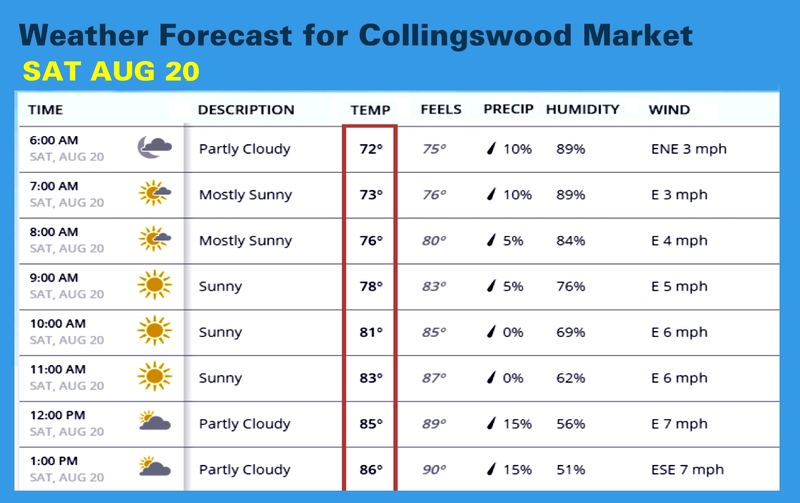 Temps climb into the upper 80s by noon, humid as a summer in Collingswood, but dry. Peach Pie Baking Contest This Week! SAT AUG 06. 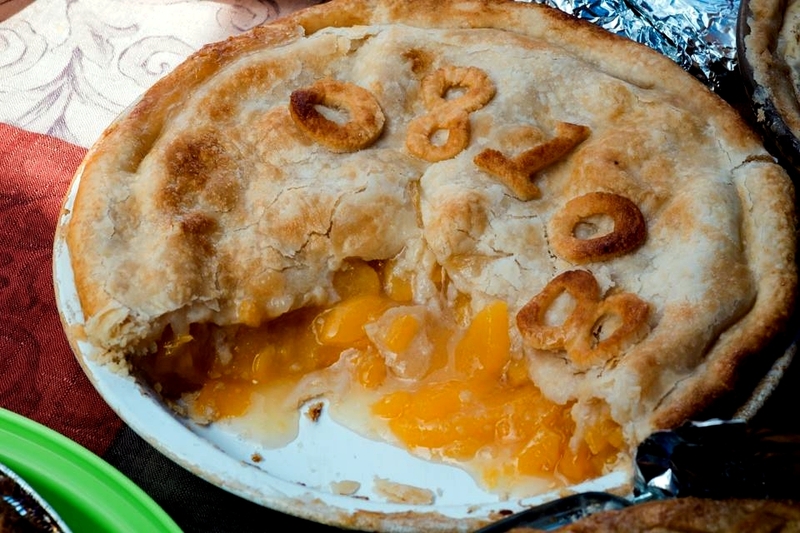 The annual Peach Pie Baking Contest kicks off Peach Month at the Market. Simple peach. Peach Plus. Best Presentation. 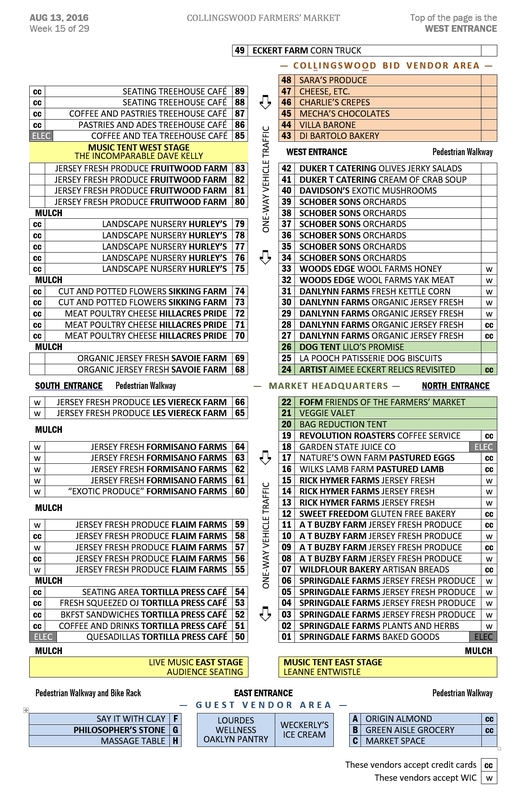 Market cash prizes in all categories. Pre-registration is required. Introductory text about the Blog Posts for this wseek. Denine Gorniak (The Bicycle-Chef). Now that the weather is too hot for cooking, but the heat is delivering a bounty of fresh tomatoes, Denine offers this no-cook recipe for tomato crudo, plus a pasta serving suggestion . LINK HERE. Patricia DiJulio (South Jersey Girls Grub). Featuring DanLynn Organic farm garlic, plum tomatoes from Viereck Farms, baby spinach and basil from Flaim Farms, ricotta cheese from Hillacres Pride, and fresh eggs from Nature’s Own Farm, Patricia assembles this beautiful manicotti. LINK HERE. Susan Mauer Lynch (Yellow Room Upstairs). Here’s another “It’s Too Hot To Cook” recipe to the rescue. Susan got her whole chicken from Hillacres Pride (You can too!) and offers this easy preparation technique that won’t heat your kitchen . LINK HERE. CANARY WORKS. Jennifer Prasad makes a large variety of handmade cushion covers to fit standard size 18×18-inch pillows. The Animal Adoption Center will staff our Dog Tent this week and administer the Official Market Leash program.